Help! I have lost my cat (dog). What should I do? If you adopted your cat or dog from The Cat House on the Kings, contact us immediately at (559) 638-8696. Please be sure your cat (dog) is microchipped and that the microchip is registered! Microchipping is an inexpensive way to ensure that you'll be reunited if your pet is found. In general, animals who have some form of identification, such as a microchip, collar or a collar and tag, may be held a bit longer for owners to come forward. Please note: The immediate search advice below is primarily relevant to lost cats. The remaining advice about posting flyers, filing reports etc. is relevant to both cats and dogs. Don't panic. Cats are territorial, and generally do not wander far from their home. If they are outdoors for the first time or outside their territory, they'll be scared by their new surroundings and will hunker down until they feel it's safe to move about. Cats generally will NOT move around during the day, but will search for food and move about at night, when it is cool, and they won't wander far if food and water are close by. Anchor your cat to your home by putting canned food and fresh water outside your back door (away from the street!). If possible, leave food in your adjoining neighbors' yards also. If ants are a problem, put the bowl of food in a larger bowl filled with water. Also put out a towel or blanket with your cat's scent on it and leave a light on at night. Check hiding spots. Cats occasionally get shut into places that are open temporarily, so check your neighbors' garages, sheds, storage areas, and crawl spaces. Alert the neighborhood by making up flyers with your cat's picture and a font large enough to be read from a passing car. Use our free tool to make a lost cat (lost dog) flyer or create your own. Print the flyers on bright colored, eye-catching paper. If it is likely to rain, put the flyers inside sheet protectors that you can get at any office supply store. Be sure that the opening in the sheet protector is at the bottom so water doesn't get to the flyer. Start close to home, then distribute the flyers in an ever-widening radius. Post the flyers where people will see them from their cars when stopped, or while out walking. Hand-deliver flyers to your neighbors, and enlist their help. If they have indoor cats, your cat may be drawn to their house. Put flyers in mailboxes or at front doors. It is possible someone nearby has been feeding your cat and is unaware that he is lost—this happens quite often. Liberty Animal Control – For unicorprated areas of Fresno County, Tulare County, Selma, Firebaugh, Parlier and Huron. For cities or counties not listed above, do a Google search using the search terms "animal control" and your city. WALK your neighborhood late at night when it is quiet and call for him. While walking, tap the edge of a can of cat food with a fork or rattle a bag of dry food. Lost pets often hide during the day. Slowly DRIVE around your neighborhood late at night—cats often recognize the sound of a car. Important: When calling for your cat, wait for a lull in any traffic so that your cat is not tempted to run to you and into the path of traffic! If someone contacts you and says they've seen your cat, ask if you can put canned and dry food in THEIR backyard to anchor him to that location. Then hang out and call his name—he won't wander if he has food and feels safe. Post flyers at local vet clinics. Someone could have picked up your cat (dog) and taken him to a vet. Talk to your neighbors, and especially children! Children are often outdoors and ride their bikes around, and thus know what's going on in the neighborhood. They are often the first ones to notice a stray. BE PERSISTENT! Someone recently once emailed us about their lost cat. They followed the above steps and found their cat 4 WEEKS later—a neighbor down the street had been feeding their cat, and didn't know he was lost. Another family had lost their cat, and found it by walking the neighborhood at night while calling their kitty's name. So please continue leaving food out, posting flyers, and canvassing your neighborhood. Persistence is key—hang in there! Help! I have found a cat (dog). What should I do? If you have found a kitten, your next step may mean life or death. Follow this advice from Alley Cat Allies. You can also use our free tool to create a flyer for your found cat (found dog). My cat ate something and is acting ill! What's poisonous to a cat? If you think you cat has been poisoned, call the ASPCA Animal Poison Control Center at (888) 426-4435. There is a $55 consultation fee for this service. Here is some additional advice to prepare you for what to do if your pet has been poisoned. See below for a list of plants toxic to cats (see I've heard some plants are poisonous to cats? Which ones are they?). I've heard some plants are poisonous to cats? Which ones are they? The ASPCA has compiled an extensive list of plants which are either toxic or non-toxic to cats, dogs or horses. They also have pictures to help you identify the plants. For your convenience we provide some easy-to-use lists which have been derived from the ASPCA information. Always double-check that you are looking at the right list! The Cat Fancier's Association has a list of plants poisonous to cats. How do I perform CPR on my cat or dog? CPR for cats and dogs is similar to CPR for humans. The procedure is described below or you can view a video demonstration. These directions assume the animal is unconscious and the risk of being bitten by the animal is not present. Remove any obstruction. Open animals mouth and make sure the air passage is clear. If not remove the object obstructing the air passage. For large dogs: close the animal's jaw tightly and breathe into the nose. The animal's chest should rise. Give 2 breaths. For small dogs and cats you may be able to cover the nose and mouth with your mouth as you breathe. The animal's chest should rise. Give 2 breaths. For large dogs you may be able to position the dogs on its back and compress the chest just like for humans. For small dogs and cats as well as large dogs with funnel chests, you may need to lie the animal on its side and compress the side of the rib cage. Alternatively you can position the animal on its back and press on both sides of the rib cage. Alternate breaths with compressions The ratio of compressions to breaths should be approximately the same as for humans - 30:2 Continue doing this until the animal responds or begins to breathe on its own. I am a victim of domestic abuse or homeless. Where can I get help for my pets? We have compile a page of resources here. Can you help me find a new home for my cat? 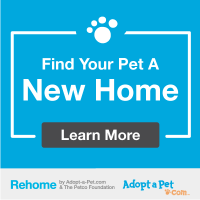 AdoptAPet.com will help you find a new home for your pet by making a listing available through their nationwide adoptable pet database. Make sure you have some good digital photos of your pet that show both his/her looks and personality. Just click the graphic below to get started. We recommend you try to find a new home with family, friends or co-workers first (people you already know best) and then try the Adopt a Pet service if you still need help. If you rehome your pet privately, we strongly recommend that you charge a reasonable adoption fee instead of giving your pet away free to someone you don't know to better ensure the potential adopter is serious about taking care of your pet. If you originally adopted the cat from The Cat House on the Kings, you may return the cat at any time at no charge just by contacting us to arrange the time and place. If you did not originally adopt the cat from The Cat House on the Kings, this is on a case-by-case basis. We prefer to try to assist in solving the individual situation or suggest ways you can find a new home for your cat on your own. If this is not an option, you must contact Lynea for approval at (559) 638-8696 before filling out our online surrender form. How much does it cost to surrender a cat? If you previously adopted the cat (or dog) from The Cat House on the Kings, there is no charge to return the animal. Can I use PayPal to send my regular surrender payments? Yes! If you submitted your surrender form online, simply click here and enter your e-mail address to look up your surrendered cat(s). Then you will get a convenient link to set up recurring payments through PayPal. Is my surrender fee tax deductible? No. The reason is that in exchange for the surrender fee we provide the service of lifetime care for the surrendered cat(s). Consequently, the surrender fee does not qualify as a tax-deductible donation. Can our rescue group exchange an unadoptable cat for an adoptable one? We do have an exchange program for qualified rescue groups. Please read the terms and conditions. The surrender form says the photo is too big. How do I make it small enough? Photos taken with a digital camera typically start out with several thousand pixels ('dots') in both width and height, so the whole picture consists of several million pixels. The corresponding data file for the picture can be several megabytes, even though the data has been compressed. The file size limit for a surrender photo is K bytes. To reduce the size of the file to meet this limit, you must reduce the number of pixels. The first step is to crop the picture to remove unneeded parts. This means trimming the picture from each of the four sides to leave only the parts you want. For example, a picture of a cat sitting on a couch in the living room should be cropped to show just the cat, not the rest of the couch, the pictures on the wall behind the couch, or the rest of the living room. If the picture is still too large after cropping out the unneeded parts, a software tool can be used to scale the photo and reduce the number of pixels used to represent the image. You want to end up with a picture which is about 400-600 pixels wide. The height of the picture will depend on the original width-to-height proportions of the picture after it has been cropped. Can I board my cat with you while I am away? Unfortunately we are not able to offer boarding at this time. We regret the inconvenience. Any tips for travelling with my pet? Both ASPCA and HSUS offer tips for travelling safely with your pets. Heathrow Airport in the UK offers a guide for international travel with your pets. I'm being deployed. Can someone look after my pets? Dogs on Deployment is a non-profit which promotes responsible pet-ownership and the military-pet community by providing an online resource for military members to search for volunteers willing to board their pets during deployments, training or hardships. Check out their flyer and follow them on Facebook. If you adopted from The Cat House on the Kings, please contact us about your adopted pet. Can you help me get my cat/dog spayed/neutered? Yes, we can help with low cost spay/neuter surgery and vaccination for cats and dogs. Please call us at (559) 638-0490 for an appointment. How many kittens can one unaltered pair of cats produce? There are various estimates around the Internet for how many kittens can theoretically be produced by one unaltered pair of cats. The usual gestation period for kittens is just 59 days and a female can have several litters a year. In fact in the Fresno area there are reports of some cats having four(!) litters a year because of the warm climate. So to estimate the number of kittens who could be produced by one unaltered pair of cats, a number of assumptions must be made. There is no general agreement on the numbers chosen for the assumptions, so we let you choose your own and see the how they play out. Just use our handy calculator and try changing the numbers to what you believe to be most likely! How can I help fix the community cats in my neighborhood? The "community" cats in your neighborhood, who don't have their own human guardians, will typically congregate in colonies where they find food. Some of the cats may be strays who have got lost and could be returned to their guardians. Others may be "feral" cats who have never been socialized to humans and remain fearful of close human contact. The best way to help these cats is to establish a properly managed colony by TNR-ing (see What is TNR?) the cats who are not adoptable, and finding homes for those who are adoptable or who have got lost and can be returned to their home. Then organize volunteers to provide food and fresh water for the colony on a daily or alternate day schedule. The volunteers and the cats will get to know each other. The cats will begin to appear as if by magic when they hear the sound of the volunteer's car pull up to deliver food! TNR stands for "Trap, Neuter and Return" (some people prefer the term "Release" instead of "Return"). TNR is a program in which unsocialized and unadoptable cats living our communities are humanely trapped, sterilized so they can't produce more kittens, vaccinated, ear-tipped (to show they have been fixed) and then returned to where they were trapped so that thay may continue to live out their lives in peace. A full TNR program includes the proper care and management of a colony of cats: All cats in the colony are "TNR'd" and volunteers provide them food and water on a regular schedule so they come to know who is part of the colony, who needs to be fixed, who need medical attention and so on. How do I learn to do TNR myself? Take a look at our TNR Basics guide. You can borrow humane traps from us for which we require a refundable deposit. IMPORTANT: You must make spay/neuter appointments for the cats you want to trap before you attempt to trap them. Otherwise you may be stuck with cats in traps and nowhere to take them to be fixed! I want to donate to you. Is my donation tax deductible? Yes. The Cat House on the Kings is a qualified 501(c)(3) tax-exempt charity. Our EIN is 27-0015288. Please note, however, that although donations are tax-exempt, surrender fees (see Is my surrender fee tax deductible?) in particular are not tax exempt. I'd like to review your financials before donating. How can I do that? Our recent financial statements are available online. I would like to leave a bequest to The Cat House on the Kings. How do I do this? Please consult your estate-planning attorney to include a bequest to The Cat House on the Kings in your will. How can I arrange care for my pets after I'm gone? The ASPCA website has a very helpful section on how to make arrangements for the care of your pets when you are no longer able to look after them. The ASPCA website has a primer on pet trusts, which are legally sanctioned arrangements that provides for the care and maintenance of one or more pets in the event of their owner’s disability or death. What is a Living Trust and why would I want one? This article on the LegalZoom website explains the benefits of a Living Trust. PayPal won't accept donations from my country. How can I donate to you? We had previously offered Google Wallet as an alternative to PayPal. However, that service was retired on March 1, 2015 so we are currently evaluating replacement payment services. How do I change the credit card I use for surrender or sponsorship payments? Click on Wallet at the top of the window. Click on Link a card below the "+" in the "Credit and debit cards" section. You will then need to confirm the credit card. This involves PayPal making a tiny charge to your card and then asking you to obtain a 4-digit code associated with that charge. To obtain the 4-digit code, login to your credit card account online and find the details of the PayPal charge transaction. Enter the 4-digit code to confirm your new card on the PayPal website. After confirming your new card you can remove the old card by clicking on Wallet again and then clicking on the old credit card. Click Edit below the credit card. Click Remove Card (beneath the Save button). Please note: If PayPal has a pending transaction associated with the old card, you will not be able to remove that card until the transaction has completed. See here for PayPal's online help with this situation. How can I adopt a cat from you? Please read our adoption process. How do I get to meet a cat I might adopt? We are open 7 days a week, except major holidays, by appointment only. For tours, adoptions or spay/neuter appointments, call (559) 638-0490. (For all other matters, please see our contact page.) For adoptions, you must submit an online application and receive approval before making your appointment. If you plan to stay overnight in the area, several local hotels offer special rates for our visitors. You may also visit our off-site adoption center at Petco, 4144 N. Blackstone Ave at Ashlan in Fresno. Call (559) 222-0228 for more information. I live out of the area. May I still adopt one of your cats? Yes, provided that your adoption application is approved. However, by choosing to travel from out of the area to The Cat House on the Kingsto adopt from us you must agree to accept 100% of the financial responsibility for the care of the cat(s) and that if something does not work out with the cat(s), you will be responsible for returning the cat(s) to us safely at your expense. (We do not have the ability or financial resources to travel out of the area to retrieve our cats.) If this is not acceptable to you, please consider adopting locally. How do I introduce a new cat to my other pets? The Humane Society of the United states has an online guide to introducing a new cat to your other pets. Please take a look and let us know if you still have questions. Why does a cat sanctuary have dogs for adoption? Any dog who enters the property must be cat friendly. Most of our dogs are abandoned as puppies who "learn" cat respect by trial and error. We are after all, The Cat House, not The Dog House! How long has the sanctuary been taking in cats? Lynea Lattanzio began taking in cats in 1992 (27 years ago). We have a 12 acre cat-proof fenced property. How do you keep the cats on your property? The property is enclosed by cat fencing: 6' chain link and 4' overhang with chicken wire netting. Chicken wire is also buried on both sides of the fence to prevent cats or dogs from digging out and predators from digging in. YouTube has a number of videos that show cat-proof fencing. How many cats live in your sanctuary? The sanctuary is home to an average of 700 adult cats. The number of kittens fluctuates according to the season. Most of our cats are rescued from the streets of the local counties (Fresno, Kings and Tulare). We receive dozens of calls a week from the public asking for help in saving the lives of kittens, cats, dogs and puppies they find. Since we are unable to accommodate the 100's of thousands of abandoned domestic pets, we offer TNR (see What is TNR?) and low cost spays and neuters (see Can you help me get my cat/dog spayed/neutered?). As a rule we try to only take in the cats and kittens that we can adopt out. That doesn't mean that we don't end up with a few unadoptables or resident cats, but as a rule we don't take in more and more cats every year. Where do all those cats sleep? Anywhere they want! There are at least 10 feeding and bedding facilities on the property. However, all are welcome in the 4,200 square-foot house. What happens to a cat when it arrives? How do you introduce a new cat to your colony? We have quarantine areas to keep new animals closely supervised in the event of stress induced illness. Some interact after a few days, some take months, some never adjust. Take a tour to see for yourself where they will live. How on earth do you vaccinate a feral cat? Like all other cats, ferals arrive either in carriers or traps. We use a small fishing net to capture the cat when the door of the carrier or trap is opened and they try to take off! This is enough to hold them still long enough to give the treatments. The cat is released back into the carrier or trap from the net to transfer them to the Pasture Project, our version of Ellis Island for newcomers. Are all your cats and dogs spayed/neutered? Absolutely! Any animal entering our sanctuary is spayed/neutered (and vaccinated) promptly as needed upon arrival. How do you deal with fleas with so many cats? We use Frontline Plus and/or Advantage Multi on the animals that we are able to handle. We use a food additive on all animals using the following recipe: 2 parts brewer's yeast to 1 part each of granulated garlic, food grade Diatomaceous Earth (not pool grade!) and L-Lysine. We heat about 4 cups of water in a microwave (8 mins) and then add a heaping spoonful of Better than Bouillon (available online at Amazon and Walmart and at Target, Safeway, Lucky, Save Mart stores, among others). Then we stir in &frac13; cup of the ingredient mixture, mixing it all thoroughly. Then we add it to a bowl with 2 13oz cans of cat food and around six cups of dry food (we use Halo) which are also well-mixed together and served on large trays. Since we feed hundreds of cats, this prepation is used a lot! The yeast and garlic are for fleas. The L-Lysine boosts their immunity and the food-grade Diatomaceous Earth kills internal parasites. We spray Fipronil purchased in a concentrate on areas where the animals sleep plus we also sprinkle Diatomatious Earth on the sleeping areas (wears away the cuticle on the insect and is an holistic way to control parasites). For more information on Diatomacous Earth, see diatomaceousearth.com, Amazon.com or saferbrand.com, among others. Food-grade Diatomacous Earth may also be applied directly to cats to control fleas. How do you keep your place from smelling like cats? No carpets! Floors are mopped daily with antibacterial detergent and bleach. Remember, if it smells like urine and feces, it is urine and feces. Enzymes are also used daily. Do you keep litter pans inside? We have about 50 inside litter pans and several outside litter boxes. We also we rake the yard (approx. 1½ acres) daily. How many volunteers go you get each year? We get anywhere from 100-200 volunteers per year between our Fresno Adoption center located inside Petco and The Cat House shelter, one of the largest show of voulteers is at our twice a year Open House. We open the gates up to over 600 guests, with tours of the facility, one of the largest silent auctions you will ever see (over 400 items to bid on), a raffle, food, music and all the cats and dogs you could possiably ever want to pet or visit with along with about 2 dozen Peacocks free roaming on the property. Are the employees at the Petco Adoption Center from Petco? No. We parterned with the Petco Foundation to build the Fresno adoption center. Grants from the Petco Foundation paid for the majority of the cost of construction and we lease the center back for $1.00 per year. We staff the center with one full time Cat House employee and several volunteers 7 days a week 8-10 hours a day. We do about 500 adoptions a year at our Fresno Petco adoption center. What is the sanctuary's largest expense? Payroll for 45 employees. It takes many hours of labor to take proper care of the animals and to enrich the areas they live in, which enriches their lives. We are always working on ways to improve the property for the animals, building a larger play yard for the seniors, larger areas with trees and climbing post for the FIV ward, improving the ways we keep the areas sanatized and clean. Adding trees for shade, exercise and protection. We currently employ 9 vet techs, housekeeping and office staff, adoption coordinators and a maintance crew. All employees are responsible for the care of the cats, starting with the vet techs and even the cleaners and office staff. With the number of cats that we have, we all have to take responsibily for their care. Do you publish statistics on your animals? Yes. Basic intake and adoption statistics are available on this website. We also submit more detailed data to the national Shelter Animals Count database. What is your succession plan for Lynea? In the event that Lynea decides to retire or run away to join the circus, Tammy Barker, our Assistant Director will take over. Tammy has been a rescuer for many years and is intimately familiar with our operation. We also have many loyal employees who have been with us for 10 years or more, so we would anticipate a smooth transition. Where can I get help with a cat behavior problem? CatChannel.com has an extensive collection of articles, many written by Marilyn Krieger, a nationally known certified cat behavior consult. She also has a good book on addressing behavior problems: Naughty No More!. The San Francisco SPCA also has a number of cat behavior resources. How can I enrich my indoor cat's life? Read Jackson Galaxy's books Catification and Catify to Satisfy for elegant ways to provide a rich environment for your cats. For some inexpensive and easy do-it-yourself ideas, the take a look at John Ridley's blog post Build your cat a better life. For some gardeners, cats and other animals are uninvited guests. One method of keeping animal visitors away is to offend their sense of smell. When cats encounter this potent mixture, they will associate it with your garden and stay away. Mix all the ingredients together and let it steep for 24 hours. Dribble the mixture around the garden every few days for two to three weeks. Soon your garden will be pet and pest free. If we could afford it, we would use Scoop Away. Currently we use Scamp Scoop, which we purchase by the pallet. How can I calculate my cat's age in human years? To convert a cat's age to an equivalent human age, an accepted method is to add 15 years for the first year of life. Then add 10 years for the second year of life. After that, add 4 years for every cat year. This means that by year two, a cat has matured to about the same as a 25 year old human. There is a convenient online age conversion calculator. What arrangements can I make for my pets after I can no longer care for them? Please visit 2nd Chance 4 Pets for advice on making arrangements for your pets to be cared for after you are no longer able to do so. Their advice addresses both arranging for a caretaker to assume responsibility for your pets and the necessary financial planning to ensure your pets are well cared for. Can I volunteer my time to help you? We can always use and appreciate volunteers. There is a wide range of options from kennel maintenance to fostering to fundraising. Please fill out our online volunteer form to tell us about yourself and what areas you would like to help with. Even if you do not live in the Fresno area, you may still be able to help us with fundraising, our newsletters, website and so on. We always need financial help, so direct financial assistance or indirect assistance through fundraising is critical to our ability to provide a lifetime home for as many cats as necessary. How do I submit my cat for Good Night Facebook? Simply post a picture on our Facebook page of one of your current cats who is sound asleep. Please note: As a policy we will not include any cat who has crossed over the Rainbow Bridge. You can sign up for our mailing list online. How do I change my mailing list preferences? To change your mailing list preferences, you must request a link be sent to your e-mail address so we know it is you requesting the change. Request the link here. Where can I get legal advice on an animal issue? The Animal Legal Defense Fund and In Defense of Animals may be able to offer advice either directly or through a referral. Alley Cat Allies also has a staff attorney who is knowledgeable about cat issues. Must businesses admit my service animal? The U.S. Department of Justice answers commonly asked questions about service animals in places of business.